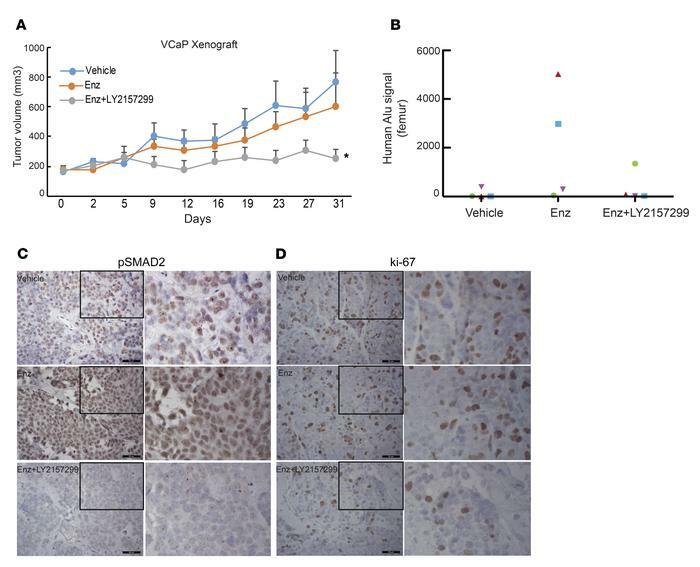 Enzalutamide and LY2157299 drug combination blocks xenograft prostate tumor growth and metastasis. (A) Castrated mice bearing VCaP xenografts received vehicle, Enz (oral, 10 mg/kg) alone or in combination with LY2157299 (oral, 75 mg/kg) 5 days per week for 33 days. Mean tumor volume ± SEM is shown. Significance was calculated using ANOVA, P < 0.05. (B) At the endpoint, mice were euthanized and femurs (bone marrow) were dissected. Genomic DNA were isolated and analyzed for metastasized cells by measuring human Alu sequence (by Alu-qPCR). (C and D) Immunohistochemistry was performed in tumor sections isolated from xenograft mice with the indicated antibodies and H&E staining. Representative images are shown. Scale bars: 50 μm.